March 30 marked the launch of CTfastrak, the 10-mile busway running between Hartford and New Britain that has all the ingredients of real bus rapid transit: exclusive lanes, off-board fare collection, level boarding, and multiple routes using the BRT infrastructure. CTfastrak saw an average of 10,344 daily riders during its first week of service in April. Since then, ridership has grown to a point where it is averaging about 14,000 rides per day. Roughly half of those rides are on routes that operate solely on the Hartford-to-New Britain busway, while the other half are on routes that include, but extend beyond, the busway. According to Transportation Commissioner Jim Redeker, ConnDOT had projected a minimum of 11,200 daily rides during first year of service. 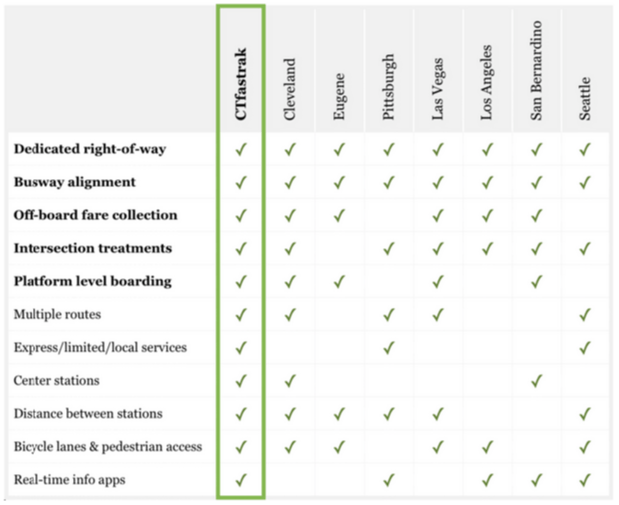 One segment of the population that has helped boost ridership beyond projected figures is the students at Central Connecticut State University, who use CTfastrak to get between campus and the nightlife in downtown Hartford. Although CTfastrak won’t see many students riding this summer, there’s reason to suspect ridership to continue to increase in the next few months — studies have shown that transit use tends to rise with the temperature — and in the coming years as transit-oriented development projects proliferate around station areas. Elsewhere on the Network today: Transportation for America reports that as the clock ticks down on the Highway Trust Fund, Congress hasn’t made much progress on a long-term transportation bill or a short-term extension. Biking Toronto shares some bad news — post-Rob Ford Toronto is still removing bike lanes. And Seattle Transit Blog explains why that city’s parking reform measures are exactly what’s needed. Now 10 years old and older, the performance of the U.S.'s first bus rapid transit systems helps explain why the model has caught fire.